Life in the Low Lands: Gelukkig Nieuwjaar / Hyvää Uutta Vuotta! On Saturday I had the chance to experience the first year change in the Netherlands. 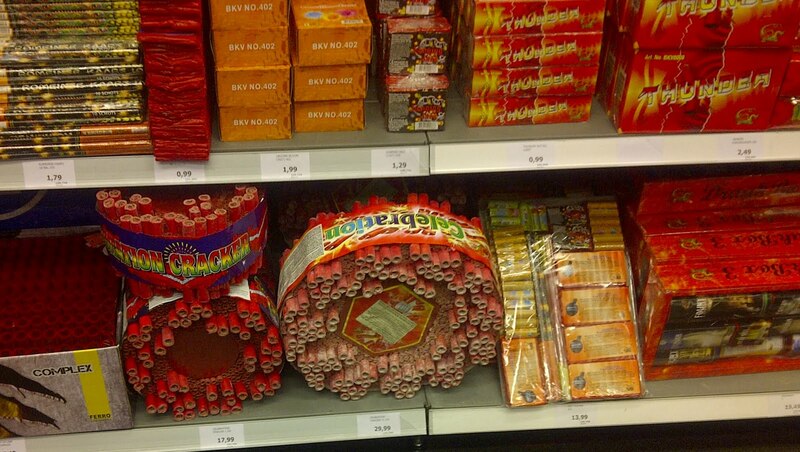 On Friday people kept wishing "Have a nice Old Year's Evening", which is the way to say it in Dutch (Oudejaarsavond). One essential part of course when changing the year is to get some nice fireworks! I am not a big fan of those making a lot of sound and going high to the sky, but more into the colorful fountains and things which stay low and are not too dangerous. We pre-ordered the fireworks from the internet and it was quite handy. While picking them up I couldn't help but notice the HUGE bombs they have here, like the one in middle of the picture below. Apparently you need to roll the whole round thing open, and then you get nice continuous explosions. The story goes, that somebody did not know that needed to be done and blew out the whole front door of his house. In general, the safety precautions here are not that strict as in Finland, which makes me feel like 80-year-old grandma sometimes when being (over)cautious. Our street is quite narrow one-way-street. The fireworks were put in the middle of the street and then we'd stay on the curb side to look at them. This was only few meters away. I spent most of the time standing/hiding behind a car or somebody else ;) Fortunately everything went fine. It was amazing to see how much fireworks people were putting in the air! It started early in the morning and continued through the night with every now and then some really big bangs which would almost shatter the windows of our house. Around New Year it is also essential to eat - a lot and unhealthy :) One of my favorite findings are the oliebollen, which are mainly deep fried doughnuts without a hole in the middle. This means, that there's a lot to eat even in a little thing. And yes, it is exactly the food which after eating makes you promise to go to the gym first thing after New Year. But they are amazingly good. I had the first one when coming from Finland after Christmas, as they were sold outside Schiphol airport. My only question is - why cannot they sell these things all year round?